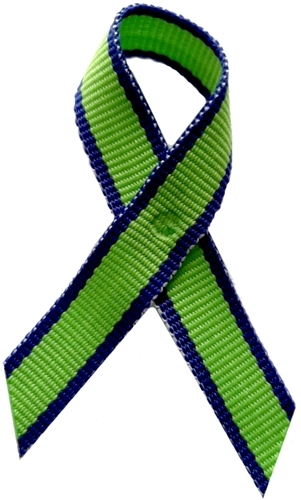 Official BFRB Awareness Ribbons: For Trichotillomania, Skin Picking Disorder & Related BFRBs - SALE! Get TWO for the price of one! Price includes shipping and handling. Bulk orders available: order 10 or more, save 25%, order 20 or more, save 35%! Discount automatically applied. Show your solidarity with the BFRB community and help educate others with BFRB Awareness Ribbons! Representing all Body-Focused Repetitive Behaviors (including trichotillomania, skin picking disorder (dermatillomania) nail biting, cheek biting, etc.). While each of these behaviors are different in their presentation, they are all related in more ways than not, which is becoming more clear as research begins to identify their underlying biological traits. These ribbons were born of an idea from BFRB activists. TLC is honored that we were all able to work together to find colors that best represent all body-focused repetitive behaviors. The color blue represents the link between BFRBs and obsessive-compulsive spectrum and anxiety disorders. Green represents healing and community, both of which are an unexpected benefit of creating awareness about such isolating disorders. Wear your BFRB Awareness colors with pride. Tell people what your ribbon or bracelet represents, or don't, it's your choice! But know that, if you see another wearing this these colors, you have found a sister or a brother who understands.